If you follow these blogs like a book, which I know millions of you do, than you will know that I promised to give an update after my next row with Scott – the row Terry joined us for. Well, it was just as fun as the first row only we had Terry following us in his launch getting us even more excited to be back on the water. Just what we needed, an outside source to encourage us! 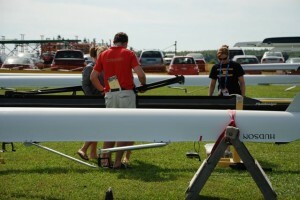 That morning the heats at World Cup II were running, and Terry had all the stats ready for us on the water. Scott has been in town for a few days staying with us. It’s a treat to have him here. He and I often find ourselves reliving stories from last summer – going over races as if they happened yesterday. You can see us here socializing. I’ve been rowing my single as often as I can, and I have been working up my volume. Initially I just touched the ends of the lake and headed in. Then I spent a few mornings doing the typical Rowing Canada warm up: paddle up to point one, pressure pyramid to the bottom of the channel, stretch the hamstrings to the island, and then a pressure pyramid on the square back up to point one. Finally I moved into doing the warm up and a work run or two. That’s when my blisters came back. On Monday I joined in with the entire team for their 7:30 AM row. Mike programmed 5 work runs for the boys – of which I completed two and a half. I’m glad to have the option to train in the single, but it became clear to me this morning that I love the 2-. This morning Scott and I jumped into the 2- for the first time since the Olympics. We went on the water before the guys showed up for the team row – and had just enough time to getting 10K under our belts. Surprise, surprise, we had to throw in a few sparkers before heading into the dock. We did a 3 and 10 up into the mid 30s that went fairly well – it was a ton of fun. So we did another. And then Scott wanted to do a longer one. We ended up doing a 3, 10 and 10. Hitting the mid 30s and then reaching up into the low 40s. It was like we hadn’t missed a day. So we’re doing it again tomorrow – only the dynamic duo will be joined by their coach Terry Paul in the morning. I had just started a big project at home when I looked out the window and there, walking up my front steps, were two semi-official looking people. My first thought went to Jehovah Witnesses or maybe Mormons. Looking closer I recognized one of them: Joanne, a very friendly master’s rower from the local club. What on earth was she doing on my doorstep? Then it hit me, and I blurted out: “Oh S**t” in front of five-year-old daughter: I had been randomly selected for “out-of-competition” drug testing. Joanne is a Doping Control Officer for the Canadian Centre for Ethics in Sport. Her husband Dave, who I had never met before, accompanied her as the CCES Athlete Chaperone; aka, the guy who was going to watch me pee. See, as a Canadian Olympic Athlete I have to provide a quarterly report of my daily locations, known to athletes as their Whereabouts Form. For each of the 90 or so days in a quarter I have to provide general locations, like home, the office and the lake, but I also have to provide a 60 minute window on every-single-day of where I’ll be, guaranteed. When I saw them, my first reaction was to lock the door and pretend I wasn’t home. Have you ever had to pee for a perfect stranger? Well, try peeing for a perfect stranger while your shirt is tucked under your chin and your shorts are at your ankles. They call it “Knees to Navel” and are quite serious about it. It reached 32 degrees yesterday and I was dehydrated. My first “specimen” looked more like a Guinness than apple juice. I only coughed up 50 ml of a required 100 ml on my first go-round. I drank all 3 and half litres that the testers brought…and nothing. Rachel looked around the house and found an extra 3 litres of bottled water for me. Trying to hurry things along, I over compensated and drank them all. Although my second specimen was a mere 20 ml, twenty minutes later my third specimen was overwhelmingly enough – indeed, nearly overflowing. But it’s not just peeing in front of strangers or even the invasion of privacy that bothers me. Yeah, collecting pee samples at the table can disrupt dinner. Sure I had plans for that hour and a half that Dave and Joanne were in my home. And yes, it was annoying to have to pee every fifteen minutes for the next 8 hours. But what bothers me most about drug tests is not-knowing the results. There are many stories of athletes testing positive but claiming their supplements were contaminated, the meat they ate was pumped full of steroids or that it wasn’t their action at fault (snowboarder…). It bothers me that I can be as clean as a whistle and still be scared out of my wits of a positive test. What if the tea I drank was bad? What if there was something in the protein powder I had in my shake? It’s 1,000,000 times worse than the anxiety I feel crossing the border into the states. Would it be that much trouble to get a confirmed negative test? I don’t know – is all this a small price to pay to ensure a clean playing field? Do other countries work so hard to catch their cheaters? Can an organization like CCES and the World Anti-doping Agency take drug testing too far? It is nice to know that my teammates are not cheating, but I already knew that. I want to know the guys I’m racing aren’t cheating. By the way – Joanne and Dave are both wonderful people, and made the evening as pleasant as possible. 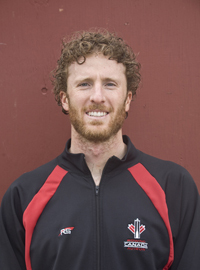 Rowing Canada is looking for “NEW ROWING TALENT” to support it’s success in years to come. Athletes who have achieved a high level of success in other sports Individuals that you feel would excel at our sport. Getting back into some rows in my new Hudson 1X I have spent a considerable amount of time reflecting on my technique. My thoughts move to what worked well for us this summer in the 2-. 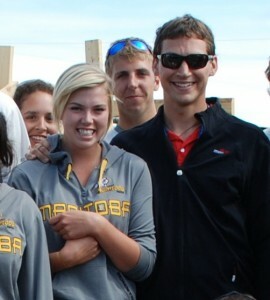 Scott and I were accused of rowing a short stroke, but perhaps we were misunderstood. 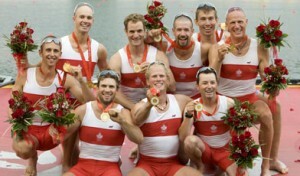 Even as we won the Lucerne World Cup the announcers claimed we were rowing “like lightweights”. No matter what you think about our stroke, it worked, but why? Mike Spracklen always talks about the importance of power per stroke and stroke length. For his crews, rate is a by-product of how much power can be applied to a long stroke. 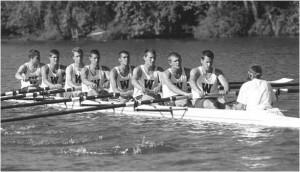 At the 2003 Milan World Championships we won the 8+ in a 6-minute plus headwind; we were three beats lower than the field with a full boat length lead at the thousand. No matter who you are – on race day, in the 2- as in the 8+, every athlete has a maximum power output that translates into boat speed. Scott and I meshed our strength, our length and our understanding of the benefits of a consistent boat speed to maximize our absolute boat speed. The difference in speed of a 2- at its fastest point in the stroke versus its slowest point has to be minimized. 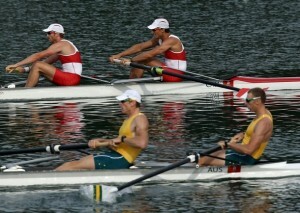 It is inefficient to have to pick up the weight of a slow boat every stroke – same theory as the fly wheel on the erg. That increased weight, when shared across an 8+ is minimized; however, in a 2- it can quickly weaken an athlete and lead to the breakdown of technique. So how do you maintain your boat speed? Watch your stern. As the stern of a 2- rises and falls per stroke cycle, the stroke-guy can visually see when to catch. 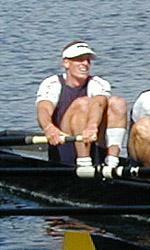 The most efficient rowing stroke keeps the stern riding high out of the water. Scott saw this every stroke, but he also felt it. Keeping the boat out of the water decreased the waterline on our hull, but also decreased the change in the waterline per stroke – both factors decreased resistance. The guys who beat us had a longer lever and a greater power output than we did. 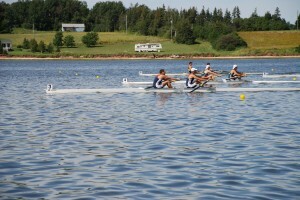 They used their length and power to race at a 35, a few beats lower then us, while maintaining the same boat speed. Their power output per stroke came at a greater cost to them, but it was a load they were trained to handle. Their strength gave them a higher maximum boat speed per stroke, but their stroke rate also gave them a lower minimum boat speed per stroke – that is, until the 3rd 500 metres of the race. Ultimately they were a faster crew, but we were able to race alongside them more so than other crews who tried to race a similar style to them, without having a similar body type. 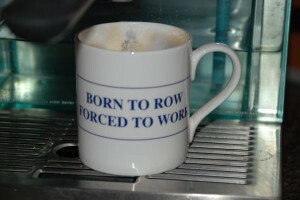 If that means I rowed like a lightweight as was called in Lucerne, so be it.